This post was promised several years ago and got lost in my Drafts folder. 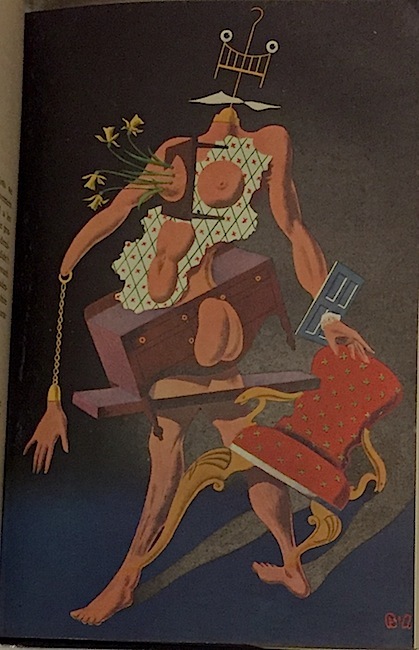 With the recent reissue of The Other Passenger by Valancourt Books I thought I ought to finish up and unveil these striking works of surrealistic art that appeared in the original UK edition of John Keir Cross' collection of macabre short stories. The artist is Bruce Angrave. The Other Passenger was originally published by John Westhouse (publishers) Ltd. in 1944 and cost a whopping £12, 6p, almost twice the usual 7/6 for a regular hardback at that time. And what a gorgeous book it is. 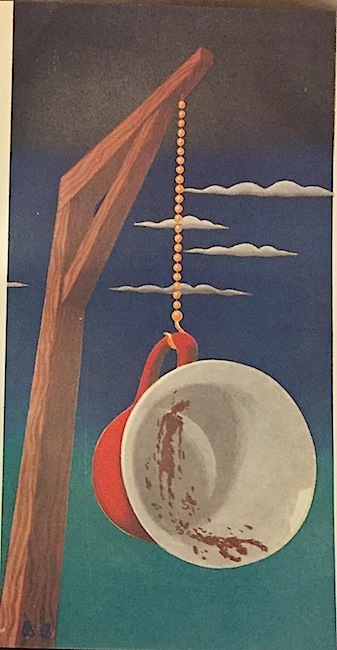 "Couleur de Rose," "The Glass Eye," "The Last of the Romantics," "Hands," "Miss Thing and the Surrealists," "Music When Soft Voices Die...","The Other Passenger"
To see a variety of Bruce Angrave's illustration art click here. Scroll down to the list of categories and click on the black boxes on the left to see his art work. 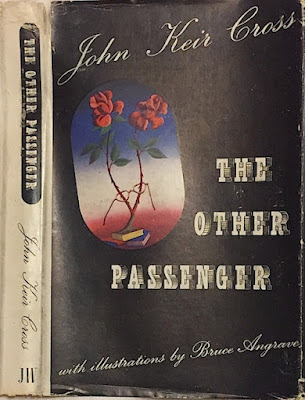 A brief sketch on the life and work of John Keir Cross is included in an especially commissioned introduction I wrote for the new edition of The Other Passenger reissued by Valancourt Books. Murder in the Closet Nominated for Edgar! 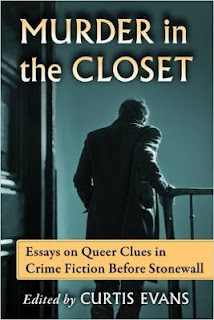 I was so excited to read this afternoon that Murder in the Closet: Essays on Queer Clues in Crime Fiction before Stonewall (McFarland, 2016) has been nominated for an Edgar in the category Best Critical/Biographical Work. Congratulations to Curt Evans who has been long overdue for recognition for his critical writing on the history of detective fiction, its developments and the lives of many under-appreciated and forgotten crime writers. Curt created the concept for Murder in the Closet and recruited over twenty writers from both international academia and the blogosphere. I was one of those contributors and delivered four essays, three of which made it to the final book. 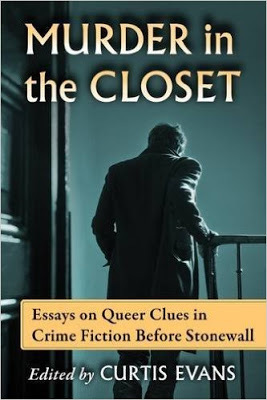 The final product is what I consider to be a landmark anthology of critical essays covering the treatment of LGBTQ themes in Golden Age detective fiction as well as discussing the lives of many gay and lesbian mystery writers like Hugh Wheeler & Richard Webb, Beverley Nichols, Patricia Highsmith, Nancy Spain and George Baxt. I'm so proud to be part of this book and that Murder in the Closet has been recognized by the Mystery Writers of America. A more detailed post about the book, its contents, and its origin appears on our esteemed editor's blog The Passing Tramp. THE STORY: One evening a singer and her piano playing lover have an argument with the singer's composer husband ending in the piano player killing the composer. The two lovers cover up the murder by making it appear that the husband died in a car accident. But their trouble is only beginning. Only a few days later the wife receives a package from, she thinks, an unknown admirer. Inside is a record and when it is played she hears the final song her husband composed called "Heart to Heart." In an odd mix of devotion and hatred he asks her to record it while simultaneously accusing her of his murder. If she records the song he promises all will be well, but if she refuses he will send on a letter to the police. Then she learns that her friend, a music publisher & producer, also received a package -- the manuscript of the music along with a set of lyrics. He also wants her to record the song. Will she give in to what appears to be blackmail from beyond the grave? 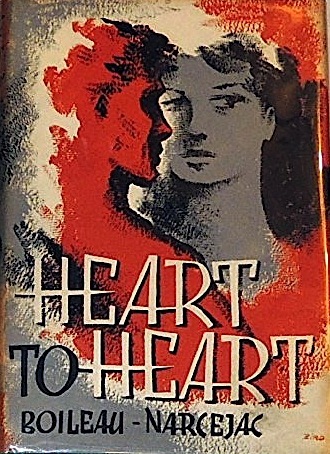 THE CHARACTERS: Heart to Heart (1959) was originally published in French under the title À Coeur Perdu (To a Lost Heart), a more fitting title encapsulating the themes of obsessive love, jealousy, possession, and retribution. As usual for Boileau and Narcejac, the story is told from a male viewpoint. 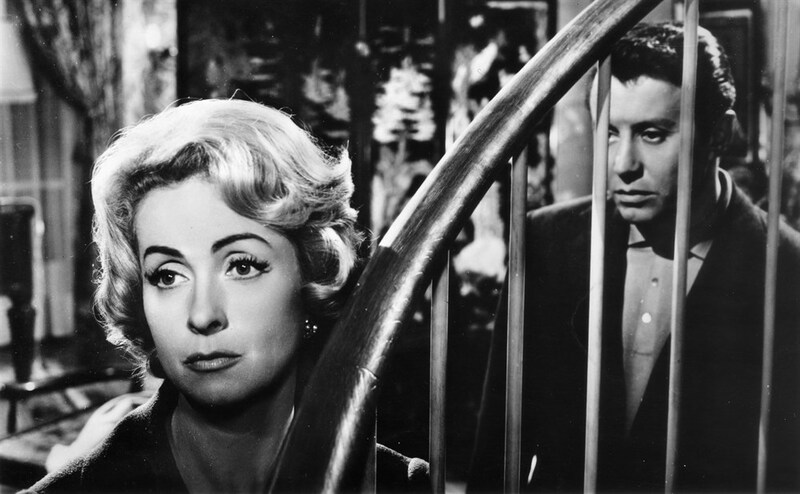 Almost exclusively we see all the events through the eyes of Jean Leprat, the pianist lover who mortally wounds Maurice Faugères when he strikes him on the head with a heavy candlestick. I noted only one scene when the story shifts to Eve's viewpoint and Jean is not present. Otherwise, we are lost in Jean's obsessive world. It is almost strictly a two character piece with the story focusing on the aftermath of the crime and Eve and Jean's embroiled love-hate affair. They are typical of the tortured lovers that fascinate these French writers. Jean like Fernand Ravinal, the protagonist of She Who Was No More, is trapped by his emotions and lost in his thoughts. Interestingly, prison imagery is prevalent recalling their masterful thriller The Prisoner (Le Louves) published four years earlier. Jean muses over his desire to be free of the woman without whom he cannot live with lines like this: "To think that I love her so much -- as though I were some kind of animal and she were my mate!" Also like Ravinel Jean finds himself at the mercy of a controlling ghost of whom he remarks: "Eve belonged more to a dead man than to the living one." Faugères' method of revenge is music. All three know that the song "Heart to Heart" will be an instant hit with its beautiful melody and lyrics describing intense longing. Jean describes the song this way: "It was a love song with a taste of tears, the rather embarrassing pathos of a farewell. But the refrain was virile stirring. It proclaimed the triumph of life." But Eve cannot sing such a song that is clearly her husband's plaintive call to her. The song is indeed recorded, but by Florence, a woman singer who was Eve's rival and who she feels is less talented, hardly an artist. Of course the song becomes a huge hit playing on the radio many times a day. And the two lovers cannot escape the song. Jean hears taxi cab drivers whistling the tune. Eve is annoyed when a elevator boy hums the song. It plays over the speakers in stores. Everywhere they go they hear the song. Jean comes to the horrible realization that Maurice Faugères "was stronger dead than alive." INNOVATIONS: The police get involved when there are faint hints of foul play at the scene of Maurice's car accident. But it becomes a full blown investigation at the novel's midpoint with an unexpected murder of a supporting character that comes as a shock to the reader. Borel, the lead investigator, has as his primary clue only the sound of a woman's voice. A cab driver reports to the police that he dropped off a woman in the vicinity of the building where the crime took place. The most distinctive feature he can remember was her low and resonant voice, a voice like a radio singer. And so the book becomes not only about music and lyrics and the emotion carried in a powerfully written song but sound of all types. It's a brilliant addition of how sound and voices can become a surreal form of haunting that will eat away at the fragile consciences of our guilty duo. She sang the first verse softly, her eyes fixed on Leprat. It was for him that she was singing. For him and for Florence, whom she was crushing with her talent. Florence ceased to exist. The challenge lent unbearable poignancy and sadness to Faugères' words. His song of farewell to Eve was transformed, in this police office, into her farewell to Leprat. Her face gradually became suffused with inexpressible grief, her voice took on inflexions that came from the blood, from the entrails; it was lacerated, agonized, and triumphant. Sound -- whether it be the spoken voice, the singing voice or music itself -- is the real force of haunting in this story of obsession and possession. 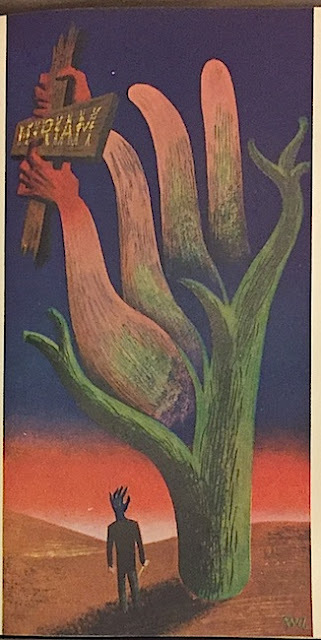 There may be the imagined ghost of Faugères reaching out to them but for these people for whom sound is such an important part of their lives, for whom music is an energy more powerful than their love for each other, it is sound that will be their undoing. 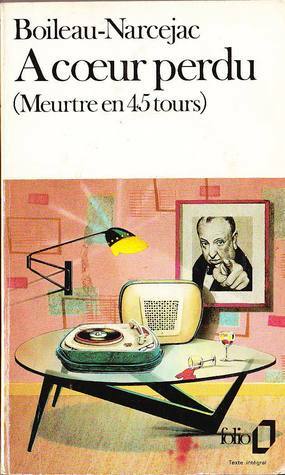 THE MOVIE: The novel was adapted for the screen as Meurtre en 45 tours in 1960. Freely adapted is more accurate. Extensively changed with most plot elements rearranged, the only features that remain unaltered are the characters' names, their relationships, and the recordings sent to Eve after her husband dies. In this rewritten movie version we never really know who killed Maurice until the rather ridiculous ending. Throughout the movie Eve and Jean suspect each other of causing the car wreck that kills Maurice. Gone is best part of the book -- the ingenious use of sound and music as methods to prey on their guilt. The screenwriters were clearly influenced by the success of Les Diaboliques (1955) and play up the possibility that Maurice may in fact be alive. The movie can be seen online in both French and English. Unfortunately, the English version is dubbed rather than subtitled. EASY TO FIND? If you read French you are in luck. 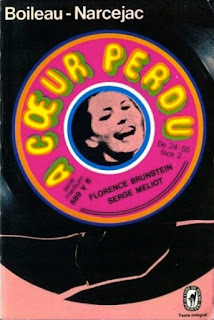 There are multiple used copies in various editions of À Coeur Perdu, all at cheap prices, from numerous US, UK and European dealers. Nearly all of these French books are paperback reprints. 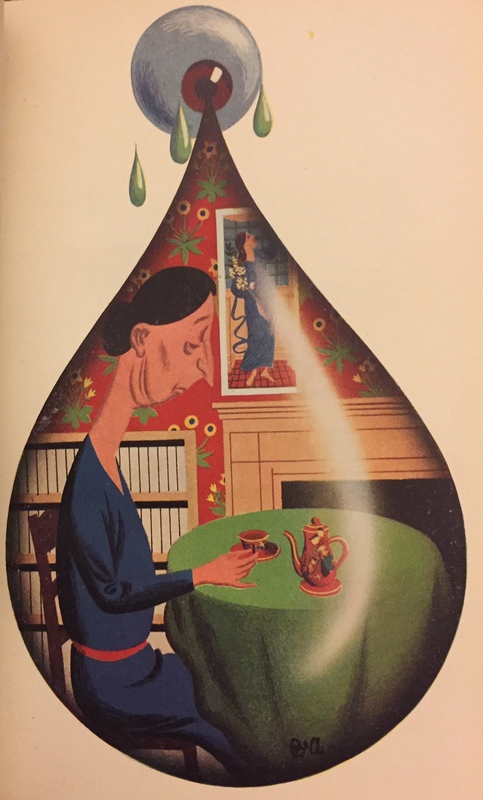 But the 1959 English edition (translation by Daphne Woodward) from Hamish Hamilton is a scarce and highly collectible book. There was only one hardback edition published in English and no paperback reprints that I know of. Currently there are only two copies available for sale: one is offered by an Australian dealer for US$108 and the other from the estimable Mysterious Bookshop in New York City for $125. Both are in fine condition and include the handsome DJ as shown from my copy up at the top of this post. This is my second favorite suspense novel by Boileau & Narcejac. It stands out as an example of that all too rare work in genre fiction -- an artistic crime novel. They continue to explore their favorite themes of obsessive love and guilty consciences, incorporate the ghost and haunting angle, and the powerful metaphoric use of music and sound makes it all sheer brilliance. Though it all ends in genuine tragedy the book also has very slight touch of the detective novel in the second murder investigation that ought to please the purists. If you are fortunate enough to find a copy I highly recommend this. I'd go so far as to claim that this is superior to their other two well known books made famous by the movies Vertigo and Les Diaboliques, but not quite at the same level as their masterpiece The Prisoner. I've been receiving lot of publicity from various publishers reminding me that Mary Shelley's landmark novel Frankenstein will be celebrating its 200th anniversary of publication which was January 1, 1818. There are various books, both fiction and non-fiction, being released this month and throughout the year in honor of this date. Soon we'll have the first English translation of Iraqi author Ahmad Saadawi's prize-winning Frankenstein of Baghdad (originally published in Arabic in 2013) which I'll be reviewing shortly. It's not just the world of literature and books involved in the bicentennial. All over the web there are websites connecting various science projects, lecture series and memes to honor Shelley and her novel with talk of cloning, stem cell research and other related topics of ethics in science research. One of the most ambitious is Arizona State's Frankenstein Bicentennial Project. This is a world wide celebration with over 100 participating institutions from 27 different countries. For a list of the universities and libraries taking part visit Frankenreads, the central website and sponsoring agency connecting the world with the "Frankenstein@200" year long celebration. You may be lucky enough to have an event or series of events in your own city or town. 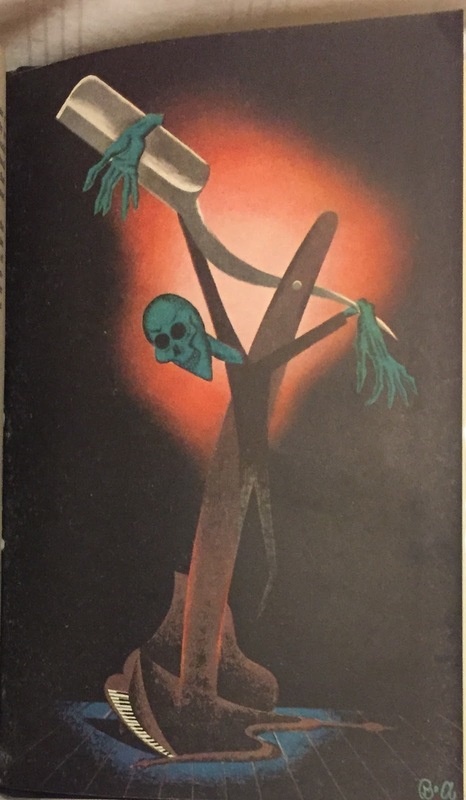 I've decided to join in this celebration by reading and discussing various contemporary books and vintage novels that employ the Frankenstein theme or Shelley's characters. I'll try to do this at least once a month on a Sunday like today. If I'm lucky in finding most of the books and read them quickly I may sneak in two per month. Why not join in the fun and read the novel itself or watch the movie and write about it on your blog? The novel is very different from the many movies, I assure you. The TV version back in the mid 1970s with Michael Sarrazin as the Creature is probably the most faithful to Shelley's novel. To start us off with a bang I'll offer up a video clip of the iconic creation scene from James Whales' original Frankenstein from 1931. 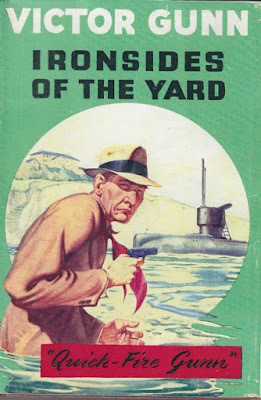 When last I looked at the work of prolific crime and adventure writer Edwy Searles Brooks I sampled the Norman Conquest thrillers he wrote under his "Berkeley Gray" pseudonym. As many crime fiction enthusiasts know Brooks used several pseudonyms and created multiple series characters as well as contributing to the Sexton Blake books. Writing as "Victor Gunn" he invented probably his most appealing detective character in a series almost as long running as the Norman Conquest books. 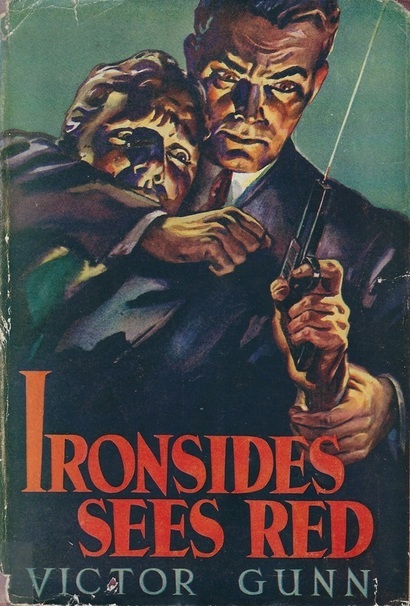 Inspector Bill "Ironsides" Cromwell makes his debut in Footsteps of Death (1939) and appears in a total of 43 books over the next 27 years. In nearly all (or a least those four I've sampled so far) he is aided by his faithful Sgt. Johnny Lister, a sharp young man with an roving eye for the ladies. Cromwell keeps his police partner in line and does his best to tutor him in his keen eyed police ways, but Lister usually falls short of the mark. The books are as varied as the Sexton Blake series ranging from detective novels to pursuit and espionage to inverted crime and suspense thrillers. Unfortunately, because Brooks started his career as a short story writer for boys' magazines and never really seemed to mature in his narrative style the books often are plagued with predictable eleventh hour death traps, villains who all but twirl their mustache ends, and cringeworthy romantic developments. But he wrote fast and furious and there's no denying as Blake or Gray or Victor Gunn that Brooks was inventive and imaginative in his plotting and was an ace storyteller. If the characters suffer from stock-in-trade personalities, speak tritely and too often in the exclamatory mood, that's only to be expected from a man who churned out so many books over his lifetime. The Dead Man Laughs (1944) is the first book I read in the Ironsides series. I was surprised that it is not a genuine detective novel at all. It's an inverted detective novel with not one, but two villains behind all the criminal activity. Nearly every inverted crime novel that reveals to us the murderer from the start also tells the story from his viewpoint exploring all the motivations and going into great detail about the methodology of his crimes. Not so here. The intriguing part of this novel is that the motive and methods are never really known until the final chapters. In this case the mysteries involve the identity of the victim of a fatal car accident that occurred during a winter snowstorm. The body is thought to be Sir Kenneth Parsloe who had the insane habit of enjoying driving around within his luxury convertible with the top down even in freezing wintry weather. He is discovered with a head injury but also completely frozen. Cromwell is sure that the body could not have become completely frozen even overnight with all the snow. Was it indeed a car accident or was there foul play? 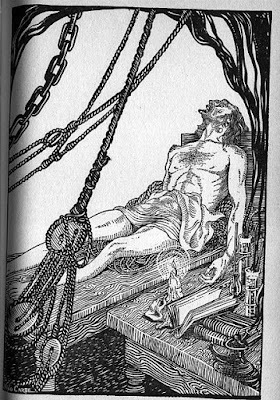 About one third of the way into the story we discover that Parsloe's brother Phillip and Dr. Thumper have something to do with either causing or staging the accident, something that is not too surprising at all given the way the two men are so evasive and insistent on burying the body. But the discovery of a cold storage plant where a taxidermist keeps his animals prior to stuffing them will provide clues to wrap up the mystery. 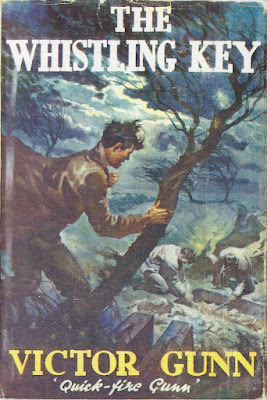 Cromwell and Lister nearly lose their lives when they are trapped in the storage plant in one of the novel's most macabrely described and best action sequences. The solution is sadly all too easy to arrive out though Brooks does his best to throw out a few red herrings like an escaped convict. But grave robbery and some nonsensical business about bearded men pretty much give away what he thought were his most clever tricks. 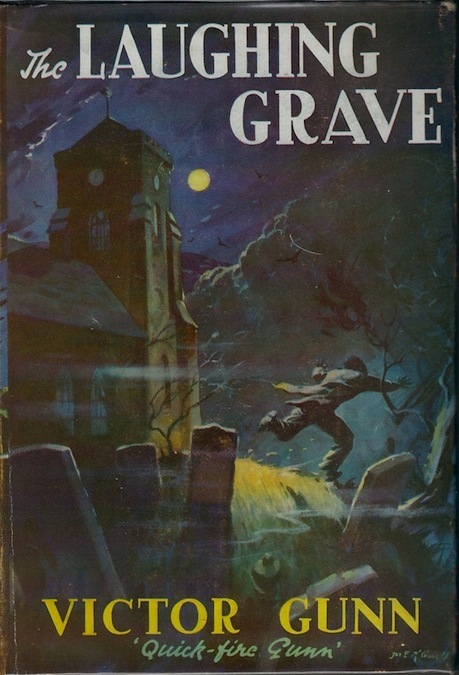 A more satisfying book is The Laughing Grave (1955). Here we have a genuine detective novel that features weird legends and apparent supernatural events, two favorite motifs in the Ironsides series. The title refers to a weird legend about cruel Judge Forbes known to laugh at each prisoner before he pronounced their death sentence. Anytime the judge's ghost is heard laughing from the local graveyard it is an omen that someone in the Haverford/Forbes clan will soon die. One night Lord Haverford, a superstitious man despite his own cruelty, hears the laugh and flees from the estate. He runs out into a road and apparently drops dead of fright after avoiding being hit by truck. But examination of the corpse reveals neither a natural death nor even an accident. A bruise on his chest indicates that he was struck by a heavy blow. The examining physician theorizes that someone stomped on him. A mud stain on the front of Haverford's mackintosh over the exact spot further supports that theory. Typical Golden Age detective novel evidence includes footprints of someone wearing socks, stolen boots and a balled up newspaper. Action is a plenty, the characters are varied and many giving us a fairly wide pool of suspects even if most of them are all too simplistically rendered. The stuff of the legend heightens the atmosphere of The Laughing Grave which has a decidedly eerie mood. Brooks works well when he lathers on the Gothic excesses. However, the killer's exploitation of the legend of the laughing judge's ghost veers into embarrassing land of Scooby-Doo style hauntings. Still it doesn't diminish the entertainment value of this book. As my second tasting in this long series I was pretty well satisfied. IT told a good tale, the detection was there albeit very rudimentary and I have to say I was surprised by the identity of the murderer. I was determined to read more to see if these books get better the more Brooks wrote. 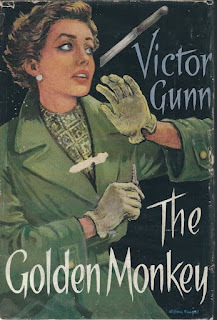 It looked like my theory was right because The Golden Monkey (1957) was my third reading and it proved to be the most satisfying of the lot. The plot is ridiculously complex compared to the other two mysteries. The cast of characters was equally complex and utterly eccentric. That this book was also set in the music hall and circus worlds made it all the more appealing to me. And to top it off the first murder involved one of my favorite bizarre Golden Age detective novel gimmicks -- knife throwing. (See reviews here, here and here.) 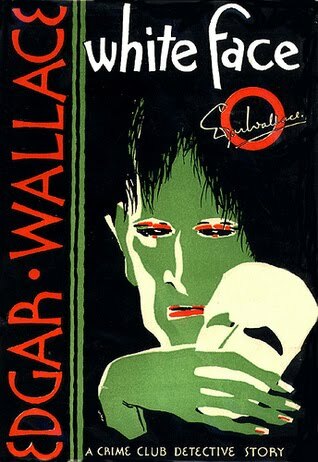 Crime writers would have us believe that the entertainment world is nothing but amorality run rampant (these days it certainly seems so) with world class criminals of all sorts making up any cast on a music hall bill or employed by a travelling carnival. In The Golden Monkey we have murder by knife throwing, kidnapping of a prized animal, theft, burglary and blackmail. Blackmail galore in this one as a matter of fact. The title character is in fact not a monkey but an ape. He's Vick, a unique chimp who serves as a ventriloquist's partner. Instead of using a dummy Valentine the voice thrower makes it appear that the chimp is talking. And it seems ownership of Vick is the most important part in solving the crime. 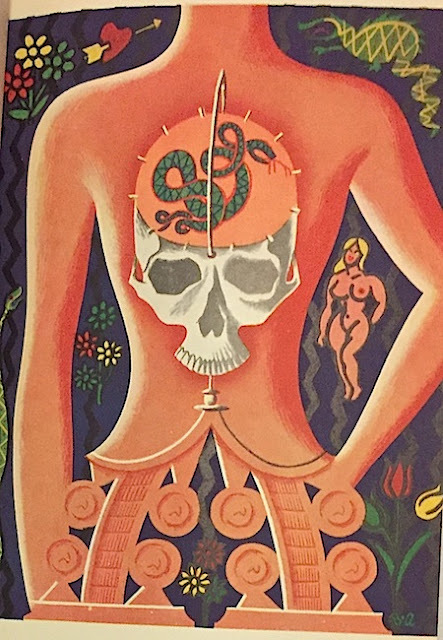 I dare not attempt to summarize the complicated tale in the past lives of Kit Barlowe, an opera singer; Rex Dillon, the knife thrower; and Valentine. But it does involve an Australian animal trainer nearly killed by a tiger that escaped from its cage and an unusual legal document drawn up to protect Vick and leave him in trustworthy hands. Brooks keeps the story of The Golden Monkey moving at a rapid pace, tirelessly piling on complications so that interest never falters. So what if everyone is blackmailing one another. There are more than enough secrets in this one to satisfy the gossip pages for decades. Isn't that the kind of detective novel you want? Sure you do, especially if you picked up a Victor Gunn book. The ending of this one has one of the most preposterous pieces of information based on fact that left me laughing the way that the grotesque stories in "Ripley's Believe it or Not!" comic strip used to affect me. But then we come to number four and disappointment begins to settle in. Just when you think that Brooks would never fully succumb to stale genre conventions or resort to lazy storytelling we get Devil in the Maze (1961). Such an ominous title. I'm sure you're all thinking as I did that here is his tribute to John Dickson Carr. For in fact it starts off just like something Carr would have written. A group of heirs are summoned to the home of an imperious aging matriarch who conducts a contest in order to determine her most worthy legatee. She will have each person travel through the baffling yew tree maze in the garden of her estate, timing each person. The one who makes it to the center, retrieves a card with his or her name on it, and makes it out in the shortest time will receive half of her fortune. The remaining heirs will receive equal portions of the remaining half. And --have you already guessed?-- someone doesn't make it out. At all. Voila! An impossible crime. Major Claude Pilbeam, the eldest who enters the maze last, never exits. The others wait for hours and set up a vigil overnight. He simply vanishes. Around three in the morning someone finds him hanging lifeless from a hook in a disused room of the huge Scott mansion. Who killed him? And more importantly how on earth did the body get out of the maze without being seen? It's not very well handled, frankly. The story is made even more ridiculous by the appearance of a scarred stranger with an eerie yellow tinge to his wrinkled face. This weird looking stranger who is always dressed in a belted blue raincoat pops up frequently over the course of the novel. In fact Yellow Face, as he is so unimaginatively dubbed by everyone, confesses to the murder to Cromwell and Lister just before he tries to kill both of them. This happens at the halfway mark lessening the surprise of a final chapter reveal. 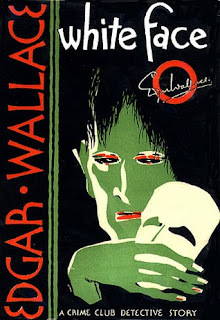 So my hope for a Carr homage vanished as quickly as Major Pilbeam and was replaced by reminders of the weakest and most formulaic of Edgar Wallace thrillers. Even the dullest minded reader will catch onto this cliché of a weird looking villain in a never changing get-up. It's an obvious disguise and with disguise usually comes a mask or make-up. And by the way -- all of this was written and published in 1961. [pause for guffaws] Seriously? I kept thinking this must've been one of those manuscripts written in the author's callow youth that he pulled out of trunk, dusted off, and sent off to his publisher laughing all the while. The solution of the Major's vanishing and his transport into the house is saved for the final two pages yet is almost casually dismissed. Even the killer says to one of the final surviving heirs, "Oh what does it matter how I got the major out of the maze?" I beg to differ. It matters a hell of a lot. It's the only reason I kept reading this ruddy book, Mr. Gunn! We do get an explanation and it involves the killer's enlisting a confederate (he had several, all of whom he later kills) who it turns out was an acrobat. Shades of The Problem of the Wire Cage? Not at all. I leave the rest to your vivid imaginations. The solution was a huge let down. Not to mention preposterous when taking into account physics and timing and the presence of six witnesses. As I said a big disappointment after three books that had truly entertaining and often ingenious plotting. As for Cromwell himself he's one of the better policeman characters out there. He enlivens the proceedings with his astute observations, his caustic humor, and his endearing irascibility. I like these cop characters who suffer no fools and give their colleagues a verbal slap upside the head every now and then. Johnny Lister is no dullard but he rarely sees the forest for the trees in these few investigations I've sampled. This is real pop fiction, gang -- mystery novels meant purely for entertainment, to while away an afternoon or two. All of the books are very short, well under 200 pages no matter where they fall in the series chronology. I have five more I've managed to accumulate and will be reporting back if I encounter one close to the genuine fun of The Golden Monkey which so far has proven to be the best of the lot. EASY TO FIND? Not really. And if they do turn up they're usually damned expensive. I've spent a pretty penny on most of the books I've managed to find. None of these books was published in the US making copies that more difficult to locate. 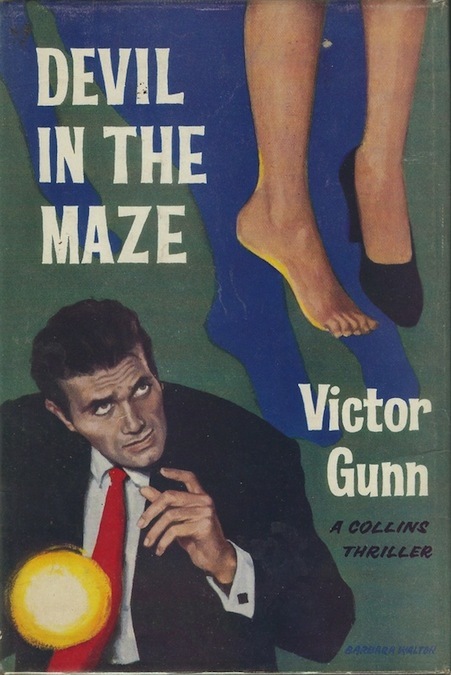 Though many of the Victor Gunn books were reprinted in paperback editions in the UK and Canada those too are becoming increasingly scarce. It may be that he's a cult collector's phenomenon. 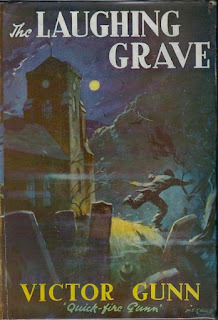 Many of these titles are next to impossible to find like The Devil in the Maze though in that case lack of copies is no real loss to mystery fans. Those who live in the UK, Canada or Australia will probably fare much better, especially if you look in libraries where he proved to be a popular author. Most of my Victor Gunn books are ex-library copies that came from Canada and there are a lot of stamps in the back of those books. THE STORY: Oliver Santley, portrait painter, is asked to travel to Beechcroft to make observations on Major Moncrieff who may be intent on harming his wife, Lavinia. He arrives a few days before a charity event involving tableaux vivant, the living recreations of famous paintings. Moncrieff has also been asked to perform some illusions as his hobby is stage magic. During a dress rehearsal for one of the more elaborate magic routines a fatal accident occurs and Moncrieff is later discovered in a costume and property storage room dead from a shot to the head. Accident and suicide or horrible murders? Inspector Pointer gets to the bottom of a very involved and perplexing case. THE CHARACTERS:The first third of Tragedy at Beechcroft (1935) introduces us to Santley; Mrs. Phillimore, mother of Lavinia and the one worried about Major Moncrieff's seemingly volatile behavior; two twin girls Dolly and Dilly, who are the latest subjects of Santley's brush; Ann Bladeshaw, the girl's governess; a couple of missionaries named Dexter-Smith, known affectionately by the girls as the Mishes; and Victor Goodenough, friend to Santley and the Moncrieffs. When Santley arrives at Beechcroft there are even more characters introduced including several servants, some business partners of the Major, the mysterious Flavelle Bruton who specializes in mosaics and her paramour Don Plutarco Ramon, a matador who brings his espada with him for the weekend! (Yes, that's a huge red flag as to what kind of murder will take place.) There's even a little dachshund that will feature prominently and fall victim to all the villainy at Beechcroft. Tragedies aplenty, both human and canine! It seems to be getting as crowded as a Victorian sensation novel, but it's all handled expertly and is not too rushed as is often a complaint about Fielding's novels so often crowded with people and plot. 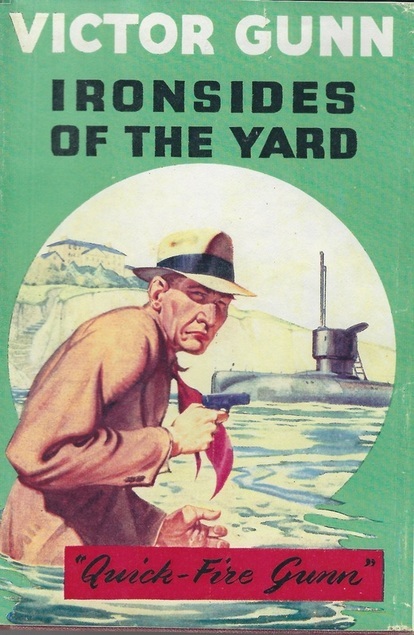 Inspector Pointer, Fielding's series detective, does not make his appearance until well past the 100 page mark when the two horrible deaths take place, followed swiftly by a suicide attempt. Prior to that the novel is loaded with back story, character relationships, and a not too extraneous tale of a kidnapping of one of Moncrieff's cousins which ended in the victim's death and the kidnapper's escape. Also, a series of jewelry robberies is plaguing the countryside surrounding Beechcroft. To cap off this deluge of crime Santley is sent on an odd errand to Brussels to deliver what he thinks is a birthday gift of a box of chocolates to the daughter of one of Moncrieff's business associates. When the box goes missing, Santley replaces it out of good faith, but is met with suspicion when he delivers the substitute gift. Sounds like a bit from an espionage thriller, doesn't it? Like every seemingly innocuous event in this densely packed book the missing box of chocolates will have later significance. Fielding does a good job of delineating this large cast, but I'm bothered by Pointer's obsession with the pseudo science of facial features as signifiers of personality. You know what I mean -- the "weak chin", "prognathous jaw", "shifty eyes" kind of writing that telegraphs we are in the presence of a bad person. I was reminded of Carolyn Wells at her worst when Pointer starts to eliminate suspects because they just look far too kind in the face to ever be considered murderers. This shows either extreme naiveté about the world or a G rated mentality about composing books according to the stringent rules Wells created back in 1917 or so. This is a shame because if anything Fielding is masterful at labyrinthine, perplexing plots. This was a real doozey, frankly. Juggling multiple criminal subplots and presenting so many permutations of possible murderers and motives ascribed to those past and present crimes shows genuine talent as a detective story writer. The last two-thirds of the novel are rife with surprises, twists, and mostly good detection. INNOVATIONS: The detective novel aspects are not exactly of the fair play mode. The reader will discover the evidence and clues as Pointer finds them, but he almost immediately applies this evidence to his intuitive theories previously discussed. Unlike the majority of detective novels where the clues are laid out (sometimes cleverly hidden) and then recalled in the finale, Fielding prefers a sort of police procedural method in telling the story. It's highly methodical but it does rob the reader of the enjoyment of trying to outsmart the detective at his own game. Only in the final third of the book is the detection presented as fair play because so many theories have been discussed and evidence found when the final pieces to the confounding mysteries are uncovered the reader does have a chance to put them all together and finger the true villain of the novel. THINGS I LEARNED: Major Moncrieff had been suffering from a feverish high temperature. Pointer finds some concentrated quinine in his room. He tells his police team: "There's the explanation of the high temperature. Soak enough cigarettes in quinine, let them dry, smoke them and you'll get a temperature promptly. It's a Foreign Legion dodge." Don Ramon is repeatedly referred to as an espada and not a matador. I knew of the term mozo de espada, but this is basically a matador's valet who dresses him prior to the fight and hands equipment from outside of the ring to the matador in the ring. This servant never enters the ring. I thought for a time that Fielding had completely misunderstood the role of this servant and conflated the two. But then some assiduous searching turned up this fact: Espada is also sometimes used as a synonym for matador. I don't know why he didn't use matador and simplify it all. Odd. But as always it was fun to learn another bit of trivia. THE AUTHOR: "A. Fielding" was thought to be a pseudonym for Lady Dorothy Moore (nee Feilding), but it has been disproven by a living relative, her grandson. Note the odd transposition of the vowels in her name and the pen name. There have been multiple online articles written about the true identity of A. Fielding but apparently because of lack of data and provable facts it cannot be said just who is or was the real person behind the pseudonym. 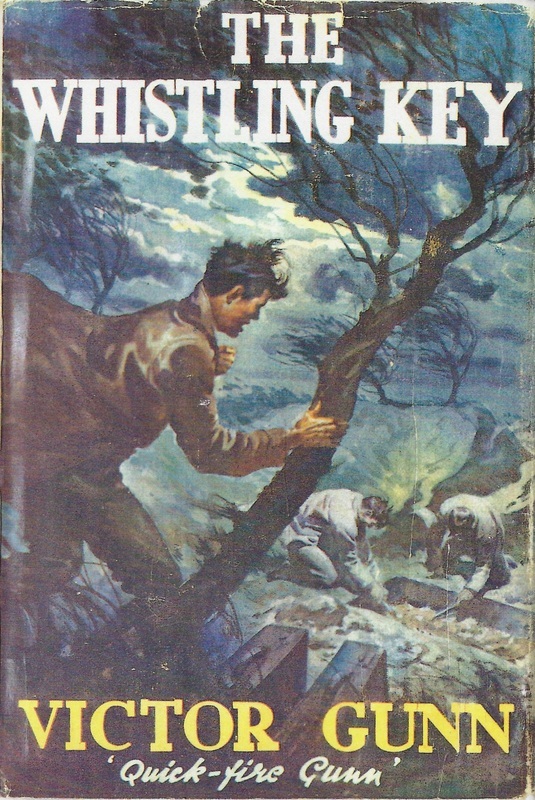 According to Fielding's American publisher H.C. Kinsey they claimed in some publicity dated circa 1942 that the author was Dorothy Feilding and lived in England. If this is true is must be a completely different Dorothy than originally thought. For those interested, I suggest reading the many articles and queries by John Herrington, the tireless research librarian, whose work has been posted on Mystery*File. The most detailed is here and includes the comments from Richard Hyde, Lady Moore's grandson, who denies she was ever a mystery novelist. EASY TO FIND? Glory Hallulejah! you're all in luck. No need to look for the scarce original US or UK hardcovers this time. 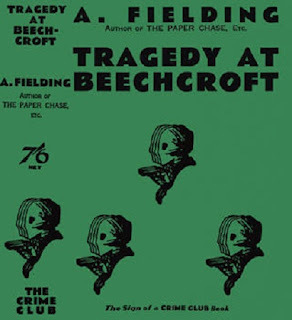 Tragedy at Beechcroft has been reissued as a digital book from Resurrected Press. In fact, most if not all of the Inspector Pointer books are available from this outfit. Though I warn you that this "publisher" is actually a one man outfit armed with an OCR scanner who has confessed that he goes to libraries scanning the pages of out of print mystery novels. According to several online reviews the Resurrected Press books are littered with typos and are badly designed. Caveat emptor! Alternatively and another good sign is that Project Gutenberg Australia has the book online for free. So knock yourselves out, gang. I enjoyed this one flaws and all. This was my first reading of A. Fielding's many mystery novels and I'll probably be tracking down a few of Fielding's other better mysteries. Next time, however, I'll be prepared for the long exposition in anticipation of the truly knockout plotting and storytelling.